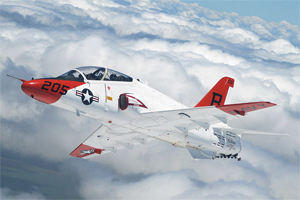 CORONA, CALIF. – The CIRCOR Aerospace Products Group, a business unit of CIRCOR International (NYSE: CIR), has been awarded a contract from The Boeing Company to design, develop, and manufacture an Accumulator Pressure Gauge that will be retrofitted on the U.S. Navy T-45 Goshawk fleet. CIRCOR Aerospace completed qualification in June 2009 and will perform final assembly and testing at its Corona, Calif., facility; production will begin the first quarter of 2010. “CIRCOR Aerospace is proud to work with Boeing to meet the needs of the U.S. Navy. We have an extensive history of designing and manufacturing various gauge products and look forward to supporting Boeing and the U.S. Navy on this retrofit program,” said Ryan E. Nelson, Director of Customer Programs at CIRCOR Aerospace Inc.